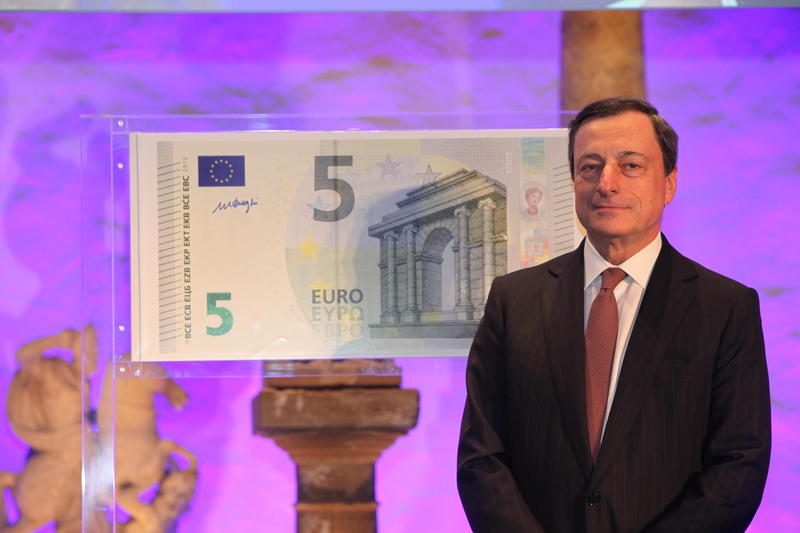 The Governor of the European Central Bank, Mario Draghi, presents the new €5 banknote. The question is who is going to profit from it? In two different articles the European Sting yesterday made important references and observations on the policy lines followed by the European Central bank. Maria Milouv in her article entitled, “European financial values on the rise”, commented as follows: “With the prospect of a further reduction of ECB’s interest rates appearing now more distant than in December, after some relevant comments by Mario Draghi yesterday”. In short Milouv said plainly that Draghi is sending a clear message to governments that the ECB will take no growth supporting measures by further reducing its interest rates this year and thus will not contribute to their efforts to resurrect growth in the crisis stricken money zone. In another article entitled “Draghi hands over to banks €77.7 billion more” also yesterday the same writer observed:” In practice the ECB is now acting in the Eurozone as “lender of last resort” for practically every bank, a function that the ECB’s governing council was denying until recently”. Those two observations depict quite different policy lines followed by ECB under Mario Draghi. In the case of efforts to re-establish economic growth in Eurozone Draghi says that the ECB will not help, while on the other hand ECB reassured everybody that Eurozone’s central bank will not let not one bankrupt bank without help. In short ECB says clearly that in the case of commercial and investment banks it will do whatever it takes to support them even if they have become illiquid by their own greed, but will do nothing to help governments restart the real economy and create jobs. Mind you that both actions are not foreseen by the statutes of ECB. If this is not an ostentatiously double standard policy then words have lost their meaning. But how come and the ECB arrived at such an anti-social policy line? Even the American central bank, the Fed, has as structural part of its policy goals the resumption and support of growth and the creation of jobs in the real economy. We will see that Draghi had a key role in this. Over the past few years that is all along the difficult period of the credit and fiscal crisis in Eurozone after 2009 the European Central Bank has being reshaping its role. The problem was that as from its institutionalisation the single currency zone’s central bank had a muted role in comparison to other major central banks; it couldn’t act as a “creditor of last resort” nor could it include economic growth and job creation in its policy mix. ECB could only use its basic interest rate instrument to control inflation. The reason was that ECB was built-in the tradition of the German Bundesbank, with no ability to help governments in their effort to target growth. No accommodation by ECB for economic growth just for banks. However the 2008-2009 great credit crunch in the US and the subsequent sovereign debt and fiscal crisis in Eurozone forced the governing council of ECB to overcome its institutional mutation and intervene actively in countering Eurozone’s crisis. The new extraordinary measures taken by ECB started materialising even with Jean-Claude Trichet in its steering wheel and took prodigious dimensions with Mario Draghi, with billions of long-term loans to Eurozone’s 5,000 banks in 2012. The same policy will be continued in 2013 according to “Super Mario”. On the contrary Draghi issued yesterday a warning to governments that the ECB will not do the same to help them resurrect growth and create jobs. Seemingly there is not enough ammunition in ECB’s arsenal to serve both targets. The problem is however that Draghi doesn’t want to serve both purposes and on top of that he, an appointed bureaucrat, finds the courage to issue further warnings to elected governments. In his introductory remarks during the monthly press conference yesterday in Frankfort he said: “As regards fiscal policies, the recent significant decline in sovereign bond yields should be bolstered by further progress in fiscal consolidation in line with the commitments under the Stability and Growth Pact”. In short he not only refusing to help the 17 Eurozone governments in their quest to create jobs but he issues directives over what they should do. For god’s sake who is he? Where from he finds the power to set policy lines for 17 governments and an equal numbers of European Peoples? Is it the end of democratic rule and the beginning of the banks’ era? Just yesterday the head of the Swiss banking group UBS accepted that bankers have become arrogant and have negative culture, meaning obviously that they don’t care about the legality of their actions nor they mind about anything else than their profit. Is this the era of the banks? Is our democracies in danger from the money sharks? Can they buy their way through to our democratic institutions? Is there a cure for all that or the Draghis will govern our land?